Headed for the launch pad, Apollo 10 commander Tom Stafford pats the nose of a stuffed Snoopy held by Jamye Flowers (Coplin), astronaut Gordon Cooper's secretary. Four monthsbefore the first humans landed on the Moon in 1969, a beagle beat them to it. Moreimportant than racing the Russians, or passing Neil Armstrong and Buzz Aldrin,was that this "World Famous Astronaut" had beat "that stupid catwho lives next door." Of course,Snoopy's moon trip only took place in the daily "Peanuts" comicstrips created by Charles M. Schulz and syndicated in newspapers the week ofMarch 10, 1969. Two monthslater though, Snoopy - along with his owner Charlie Brown - took a differenttrip to the Moon, only this time it was for real. Serving as the spacecraftnames for NASA's final lunar landing dress rehearsal, Charlie Brown and Snoopycleared the way for Neil and Buzz to become the first men on the Moon. Snoopy'sspace flights, both those real and imagined, are celebrated in "To theMoon: Snoopy Soars with NASA", a six-month exhibitthat opened Saturday at the Charles M. Schulz Museum in Santa Rosa,California. "Wewere thinking about the fact that it was the 40th anniversary of Apollo 10 andhow wonderful it would be to explore that connection between the Peanutscharacters and NASA," curator Jane O'Cain told collectSPACE. Theresulting exhibition, which runs January 31 through the 40th anniversary of thefirst manned moon landing on July 20, 2009, uses both space exploration andSchulz artifacts to guide visitors through the past four decades of Snoopy'sspace adventures. Dividedinto four themed-sections, "Snoopy Soars with NASA" first introduceshow the comic strip beagle came to serve as the space agency's official safetywatchdog. In 1968,Snoopy began promotingsafety awareness and contamination control within NASA facilitiesappearing on posters, many of which are on display in the exhibit. The agencywas granted use of the cartoon character so long as Schulz drew Snoopy on allthe NASA-related material and a copyright notice accompanied the artwork. "Ibelieve their thought was that Snoopy was such a wildly popular character thatit was a way to gain people's attention and get them to concentrate more onwhat was going on," explained O'Cain. Schulz'sfirst drawing of Snoopy as an astronaut was not for a poster but rather a pinto be flown in space and then rewarded to fewer than 1% of the NASA workforceyearly. "Wehave [in the exhibit] the original drawing that Schulz did for the template forthe Silver Snoopy award pin," said O'Cain of the "astronauts'personal award" presented for outstanding contributions to their missions'success. "It is fascinating because it was his first attempt at drawingSnoopy as an astronaut. You can actually see the pencil under-drawing as hegrappled with where would Snoopy's arms be if he was carrying the [oxygensupply] suitcase and how would he draw the actual suit." Fortunately,Schulz had hands-on access to a flight suit courtesy the co-owner of the companychosen to mint the Silver Snoopy pins, by nature he was also in the Marines. "SoDon Fraser actually brought out his flight suit to Schulz's office here inSanta Rosa so that Schulz could kind of get an idea about how to go aboutdrawing Snoopy as an astronaut," recounted O'Cain. "I am kind ofhoping that people will appreciate the kind of stretch that Schulz went tocapture Snoopy in that way." As asecretary in the Astronaut Office in 1969, Jamye Flowers was assigned on temporaryduty to the Cape for about six weeks prior to launch to work with the Apollo 10prime, backup, and support crews in the crew quarters' offices. It was therethat Flowers got caught up in the pre- flight preparations... literally. 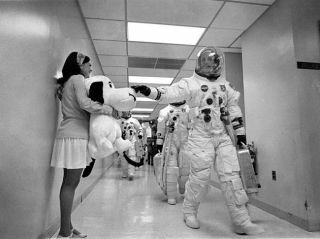 Continue reading atcollectSPACE, where you can also view photographs from the "SnoopySoars with NASA" exhibit and see Charles Schulz's original rendering ofSnoopy as an astronaut. Copyright 2009 collectSPACE.com. All rightsreserved.